For other uses, see Ante Pavelić (disambiguation). Ante Pavelić (Croatian pronunciation: [ǎːnte pǎʋelit͡ɕ] ( listen); 14 July 1889 – 28 December 1959) was a Croatian general and military dictator who founded and headed the fascist ultranationalist organization known as the Ustaše in 1929 and governed the Independent State of Croatia (Croatian: Nezavisna Država Hrvatska, NDH), a fascist Nazi puppet state built out of Yugoslavia by the authorities of Nazi Germany and Fascist Italy, from 1941 to 1945. Pavelić and the Ustaše persecuted many racial minorities and political opponents in the NDH during the war, including Serbs, Jews, Romani, and anti-fascist Croats. Searching for work, his family moved to the village of Jezero outside Jajce where Pavelić attended primary school, maktab. Here Pavelić learned Muslim traditions and lessons that influenced his attitude towards Bosnia and its Muslims. Pavelić also attended a Jesuit primary[dubious – discuss] school in Travnik, growing up in a Muslim-majority city. Bosnian Muslim culture was later to become a major influence on his political views. [need quotation to verify] Pavelić's sense of Croat nationalism grew from a visit to Lika with his parents where he heard townspeople speaking Croatian, and realised it was not just the language of peasants. While attending school in Travnik he became an adherent of the nationalist ideologies of Ante Starčević and his successor as the leader of the Party of Rights, Josip Frank. 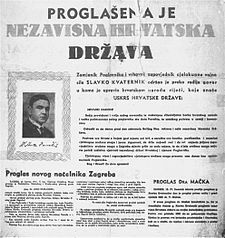 After the assassination of Croatian politicians in the National Assembly, of which he was an eyewitness, Pavelić joined the Peasant-Democratic Coalition and started to publish a magazine called Hrvatski domobran [hr] in which he advocated Croatian independence. His political party radicalised after the assassination. He found support in the Croatian Rights Republican Youth (Hrvatska pravaška republikanska omladina), a youth wing of the Party of Rights led by Branimir Jelić. On 1 October 1928 he founded an armed group with the same name, an act through which he openly called on Croatians to revolt. This group trained as part of a legal sport society. Yugoslav authorities declared the organization illegal and banned its activities. That autumn Pavelić published a brochure called Establishment of the Croatian State: Lasting Peace in the Balkans which summarized important events of Croatian history. 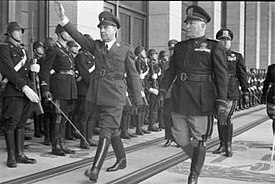 The Italian authorities did not want to formally support Ustaše or Pavelić, to protect their reputation;[clarification needed] nevertheless, the group received support from Benito Mussolini, who saw them as a means to help destroy Yugoslavia and expand Italian influence in the Adriatic. 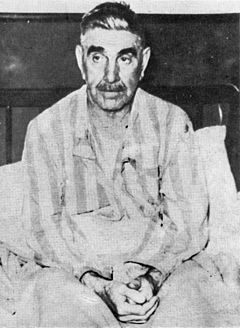 Mussolini allowed Pavelić to live in exile in Rome and train his paramilitaries for war with Yugoslavia. In the Ustaša organization of 1929—1930, Pavelić's closest associates were Perčec, Jelić, Ivan Perčević and later Mladen Lorković and Mile Budak. Hundreds of citizens, members of the Ustaše Movement and the Domobranstvo (Army) protested on 25 December 1941. [clarification needed] Pavelić tried to retrieve the lost areas, but kept his real feelings and those of the people from the Italians to maintain the pretext of good relations. Moreover, Pavelić agreed to name Prince Aimone, Duke of Aosta as King of Croatia to avoid a union with Italy, but Pavelić delayed the formalities in the hope of gaining more territory in return for accepting the new king. However, Aimone declined and never ruled the Croatian state. Communist propaganda attacked Pavelić over the Italian annexations. [need quotation to verify] On 10 July 1941, Pavelić accepted the annexation of Međimurje by Hungary. 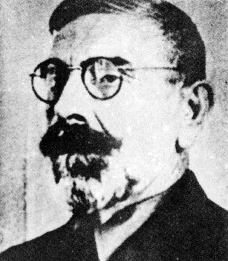 Pavelić loyalists, mainly Ustaše, wanted to fight the Communist-led partisans while others, unnerved by the idea of a new Yugoslavia, also supported him. [need quotation to verify] In 1941-42, the majority of Partisans in Croatia were Serbs, but by October 1943 the majority were Croats. This change was partly due to the decision of a key Croatian Peasant Party member, Božidar Magovac, to join the Partisans in June 1943, and partly due to the capitulation of Italy. In January 1943, Glaise told Pavelić that it would be better for everyone "if all concentration camps in the NDH were closed and their inmates sent to work in Germany". 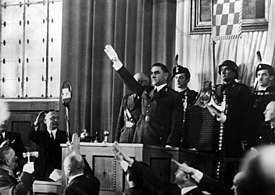 Löhr also tried to get Hitler to remove Pavelić, disband the Ustaše and appoint Glaise as plenipotentiary general with supreme authority over the territory of the NDH. 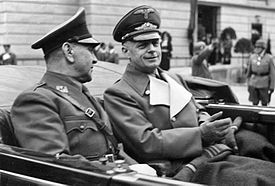 By March Hitler had decided to give the task of pacifying the NDH to the Reichsführer-SS (Field Marshal) Heinrich Himmler, who appointed his own plenipotentiary, Generalleutnant der Polizei (Major General of Police) Konstantin Kammerhofer [de]. Kammerhofer brought the 7th SS Volunteer Mountain Division Prinz Eugen to the NDH and established a 20,000-strong German gendarmerie with a core of 6,000 Volksdeutsche reinforced by Croats taken from the NDH Home Guard and police. This new gendarmerie swore allegiance to Hitler, not Pavelić. Pavelić took up employment as a security advisor to Argentinian president Juan Perón. Pavelić's arrival documents show the assumed name of Pablo Aranjos,[need quotation to verify] which he continued to use. 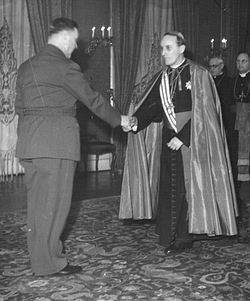 In 1950 Pavelić was given amnesty and allowed to stay in Argentina along with 34,000 other Croats, including former Nazi collaborators and those who had fled from the Allied advance. Following this, Pavelić reverted to his earlier pseudonym Antonio Serdar and continued to live in Buenos Aires. As for most other political immigrants in Argentina, life was hard and he had to work (as a bricklayer). 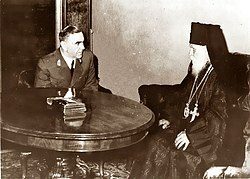 [need quotation to verify] His best contact with the Peróns was another former Ustaša Branko Benzon, who enjoyed good relations with Evita Perón, wife of the president. 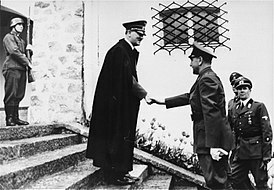 Benzon had briefly been the Croatian ambassador to Germany during World War II and had known Hitler personally, which benefited Croatian-German relations. Thanks to Benzon's friendship with Evita Perón, Pavelić became the owner of an influential building company. Not long after arriving he joined the Ustaše-related "Croatian Home Guard" (Croatian: Hrvatski domobran) organization. At the end of the 1940s, many former Ustaše split from Pavelić because they believed that Croats, now under new circumstances, needed new political direction. Many who split from Pavelić continued to call themselves Ustaše and sought the revival of the Independent State of Croatia. The most well known of these separatists was the former Ustaše officer and head of the NDH concentration and extermination camp network, Vjekoslav Luburić, who lived in Spain. [need quotation to verify] In Argentina, Pavelić used the "Croatian Home Guard" to gather Croatian political emigrants. 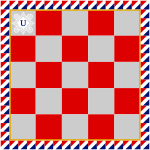 Pavelić tried to expand the activities of this organization, and in 1950 founded the Croatian Statehood Party,[need quotation to verify] which ceased to exist that year.